Medicare supplement insurance plans by private insurance companies can assist in paying for a portion of the out-of-pocket costs not covered by Medicare Parts A and B. These are standard plans associated with letters like “F” and “N” that have core benefits that remain unchanged between company to company; however, plan availability can vary by state and insurer. Do Medicare supplement plans replace Medicare Parts A and B? The answer is no. Medicare supplement insurance plans work in tandem with Medicare Parts A and B to ad in covering a portion of out-of-pocket health care expenses. For example, Medicare Part B typically covers 80% of costs, and the rest is up to the insured. Buying Medicare supplement plans to go along with your existing Medicare Parts and B coverage can assist you in paying for medical expenses not taken care of by Medicare. What sort of out-of-pocket expenses are covered by a Medicare supplement plan? A Medicare supplement plan will differ between plans offered by different insurers; however, they each offer the same standard benefits. Typically these plans offer coinsurance for Medicare Part A hospitalization expenses and cover 20% of Medicare-approved costs. Standard benefits usually cover the initial 3 pints of blood each year and provide Part A coinsurance for hospice care. Are “Medicare supplement” and “Medicare Advantage plans” interchangeable? Negative. Medicare supplement and Medicare Advantage* plans aren’t the same. A Medicare supplement plan can be bought in additional to Medicare Parts A and B coverage, while Medicare Advantage plans (aka Medicare Part C) provides Medicare-approved standalone coverage combining hospital costs, doctors’ visits, outpatient care and occasionally prescription drug benefits into a single plan. You can’t acquire both a Medicare Advantage plan and a Medicare supplement plan simultaneously but are both offered via private insurance companies. 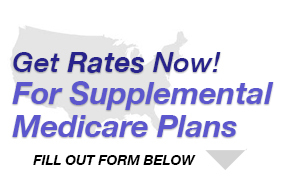 *Please note that Medicare Advantage may not be offered in all states/territories in the USA. How to Medicare supplement plans differ across different insurance companies? Regarding standard benefits, Medicare supplement insurance plans never change. However, there are differences, such as added benefits provided by a particular insurance company, as well as the quality of customer service offered. When am I able to apply for Medicare supplement insurance? When you are enrolled in Medicare Parts A and B, you may always opt for Medicare supplement insurance plans. Should you apply for Medicare supplement plans within 6 months of your 65th birthday and Medicare Part B enrollment, you are virtually guaranteed for approval. In certain states, you will be guaranteed regardless of the timeframe in which you apply. Can my plan be cancelled due to new health conditions? A Medicare supplement insurance plan is lifetime-guaranteed – age and health are not a factor – provided that you are fully paid up on your premium payments and there is no material misrepresentation on your application. Do I have to choose a specific doctor with my Medicare supplement plan? Thankfully, with Medicare supplement plans, you are given the choice of any doctor, specialist or hospital provided they accept Medicare patients. Do Medicare supplement plans cover Rx drugs? Currently, Medicare supplement insurance plans do not cover Rx drugs, which are available under a separate plan, Medicare Part D, which is available by way of private Medicare-approved insurance companies. However, there is a choice of different plans available, and these plans will vary depending upon the insurer. What is the cost of a Medicare supplement plan? Monthly premiums vary based on the amount of coverage you desire and the insurance company chosen. When researching Medicare supplement plans, take into account how much you will be expected to pay for hospital stays, visits to the doctor, as well as how much you are comfortable spending on monthly plan premiums and out-of-pocket expenses. Being educated about your personal needs and how you will utilize Medicare supplement insurance plans will aid you in choosing the best plan with the ideal cost and benefit structure for your needs. How much Medicare supplement insurance coverage will I need? You can choose between higher-benefit plans (which cost more), or you can opt for lower premiums with minimal benefits. Plans with higher benefits offer the greatest amount of supplement coverage and may pay up to 100% of your out-of-pocket expenses for a wide variety of services. Can you help me choose a plan suitable for my needs? It’s important to do your own research, because choosing Medicare coverage is not a simple task. We suggest reaching out to an insurance company’s customer service, contacting a local insurance agent, or even asking a friend. When considering plans, take into account how much coverage you will need and how much you’re comfortable paying on a monthly basis. This helps you to narrow down your options. When am I able to sign up for Medicare supplement insurance? Upon enrolling in Medicare Parts A and B, you are then eligible to sign up for Medicare supplement insurance plans at any time. You will be guaranteed approval into Medicare supplement insurance plans should you enroll within 6 months starting on the 1st day of the month that you’re BOTH at least 65 years of age or older AND enrolled in Medicare Part B. In certain states, your approval is a given even if you happen to enroll outside of this timeframe. Upon reaching the age of 65 and if you are getting Social Security or Railroad Retirement Board benefits, in many cases, you should automatically enroll in Medicare Parts A and B. If you do not happen to meet these criteria, you will then have to sign up for coverage. You are able to do this 3 months prior to your 65th birthday (aka your Initial Enrollment Period). What does the Medicare Initial Enrollment Period Entail? It’s a 7 month period beginning 3 months prior to your 65th birthday, and it ends 3 months after your birth month. E.g. If you will be turning 65 in July, your Medicare Initial Enrollment Period is from April 1st to October 30th. If you’re not automatically enrolled based on the previously mentioned criteria, then you can apply by visiting SocialSecurity.gov or call/visit your local Social Security office. If you happen to be eligible for Medicare due to disability or End-Stage Rental Disease, browse Medicare.gov for more information on how you can apply. What will happen if I don’t sign up for Medicare during the Initial Enrollment Period when I reach the age of 65? You’ll still get a chance to apply during the Medicare General Enrollment Period, which occurs each year from January 1st to March 31st. Upon enrolling in coverage during this period, it will then take effect July 1st of that year. You can sign up for Medicare Part A, Medicare Part B (or both) if you didn’t sign up initially during the General Enrollment Period. In certain situations, you will have to pay a penalty for late enrollment, however. If you work past the age of 65, then you can be eligible to apply during a Special Enrollment Period that helps you to avoid penalties, coverage lapses and medical underwriting. Are there any penalties if I don’t enroll in Medicare during the Initial Enrollment Period? Yes, there could be premium penalties for Medicare Parts A and B should you happen to miss the initial enrollment dates, so we do recommend that you sign up when you are initially eligible. The penalty for not enrolling in Medicare Part A entails 10% of the Part A premium. You’ll pay the premium penalty for 2x the amount of years that enrollment is delayed. The 10% premium penalty applies regardless of how long the Medicare Part A enrollment is delayed. E.g. Should you be eligible for Medicare Part A for 1 year, but you did not enroll, then you will be charged higher premiums for 2 years. Should you opt not to sign up for Medicare Part B when initially eligible, then you might need to pay a penalty to acquire it down the road. This penalty entails 10% of the Part B premium for every 12 months that enrollment was delayed, and you’ll need to pay the penalty for each month for the entirety of your Medicare Part B enrollment. E.g. If your Initial Enrollment Period ended November 30, 2012, and you delayed enrollment for Medicare B until February 2015 during the General Enrollment Period, the Part B premium penalty is 20%. Although you waited 26 months to enroll, the penalty only includes the two full 12 month periods, BUT you’ll be paying the penalty for the entire duration that you have Medicare Part B. You can delay enrollment in Medicare Parts A and B without penalty should you qualify for a Special Enrollment Period. Special Enrollment Periods allow you to sign up for Medicare for the first time or switch coverage beyond the Initial Enrollment Period without having to deal with late premium penalties, lapses in coverage, or medical underwriting. In the event that you did not enroll in Medicare Parts A and B during the Initial Enrollment Period due to being covered via a group health plan based on your current employer (your own, your spouse’s or a family member’s if you are disabled), you can then apply for Medicare Parts A and B while being covered by the group health insurance plan during the 8 month period beginning the month after your employment or group coverage comes to an end (whatever occurs first). Other means to qualify for Special Enrollment Periods involve moving out of your plan’s service area, having Medicaid, having a limited income qualifying you for extra help through Medicare, living in an institution (e.g. nursing home). How can I enroll in Medicare during the Special Enrollment Period? To begin enrollment, visit SocialSecurity.gov or call or visit your local Social Security office. Should you happen to be eligible for Medicare due to disability or End-Stage Renal Disease, visit Medicare.gov for more information on enrollment. When is an ideal time for enrollment in standardized Medicare supplement insurance plans? It is ideal to sign up for Medicare supplement insurance plans during open enrollment (lasting 6 months and beginning on the 1st day of the month that you’re at least 65 years of age AND enrolled in Medicare Part B, due to your eligibility being guaranteed and you can receive benefits even if you have pre-existing conditions*). You can also opt for a plan available within your state. Certain states have ongoing open enrollment, while others offer extended open enrollment periods. *A pre-existing condition is a health problem that one has prior to when a new health insurance policy begins. Medicare supplement insurance cannot exclude pre-existing condition coverage for more than 6 months. What happens when I miss out on my 6 month Medicare supplement insurance open enrollment period? In the event that you miss your 6 month enrollment period, you are still able to sign up for Medicare supplement insurance coverage at any time, though you could be denied or charged a higher premium should your health history suggest you are at a heightened risk. How can I sign up for Medicare supplement insurance plans? After you’ve done diligent research to decide the Medicare supplement plan that’s most suitable for your needs, reach out to the insurance company to start enrollment. There could be several different ways to apply (it depends on the insurance company). These could include meeting with a licensed insurance agent or producer, visiting the company’s website, contacting the company by phone, or submitting an application received in the mail. You’ll be eligible for Medicare upon turning 65 provided that you or your spouse has worked in Medicare-covered Employment for a minimum of 10 years and you’re a US citizen or permanent resident for at least 5 consecutive years. I’ve yet to reach the age of 65. Would I still be able to qualify for Medicare? There are a few factors determining Medicare eligibility for those below the age of 65, including if you’ve been entitled to Social Security disability benefits for a minimum of 24 months, if you’ve received disability pension from the Railroad Retirement Board, if you have Lou Gehrig’s disease, or if you have End-State Renal Disease. If my retirement is delayed, and I continue working beyond age 65, must I take action with Medicare? Generally, you can postpone Medicare enrollment without penalties as long as you remain employed AND covered under your employer’s or union’s group health plan. If your employer has less than 20 employees, you may need to enroll in Medicare. In this scenario, your employer’s health plan is secondary to Medicare. Contact your employer’s plan admin to find out more about your plan and how it works with Medicare. Reach out to your employer’s plan administrator to learn how your plan would work with Medicare. Retiree benefits and COBRA aren’t considered employee coverage. If you’re covered through either of these, you’ll need to apply for Medicare once you’re 65 or older. Should you retire during your Initial Enrollment Period, you won’t be eligible for your Special Enrollment Period until the Initial Enrollment Period terminates. If you don’t sign up during your Initial Enrollment Period, then you risk premium penalties and delays in coverage. Can I get employer insurance and Medicare simultaneously? It is possible, but if your employer has 20 employees or more, your group health plan will be considered your primary plan. If your employer covers 100% of most medical expenses, you might pay the Medicare Part B premium, which translates to little value to you. That’s why it is ideal to contact your employer’s plan administrator to find out more about your plan and how it would work with Medicare. Can I use my employer’s Health Savings Account (HAS) for Medicare out of pocket expenses? Upon retiring and enrolling in Medicare, you can use the balance of funds in your Health Savings Account (HAS), but according to IRS regulation, you can’t continue to contribute to your HAS account.